Four of the five candidates for Fourth Ward Alderman — Gregory Seal Livingston, Ebony Lucas, Gerald Scott McCarthy, and Marcellus Moore, Jr. — attended the event. The Fourth Ward aldermanic election will take place next Tuesday, February 28. The final Fourth Ward aldermanic forum before the election was hosted by the University of Chicago Democracy Initiative and the nonprofit Chicago Votes yesterday at Chapin Hall. Four of the five candidates for Fourth Ward Alderman—Gregory Livingston, Ebony Lucas, Gerald Scott McCarthy, and Marcellus Moore Jr.—attended the event. Interim Alderman Sophia King was invited but did not respond. Described by Rolling Stone as “the man trying to take down Rahm Emanuel,” Coalition for a New Chicago founder and CEO Livingston discussed his plans to tackle violence, education, and employment. 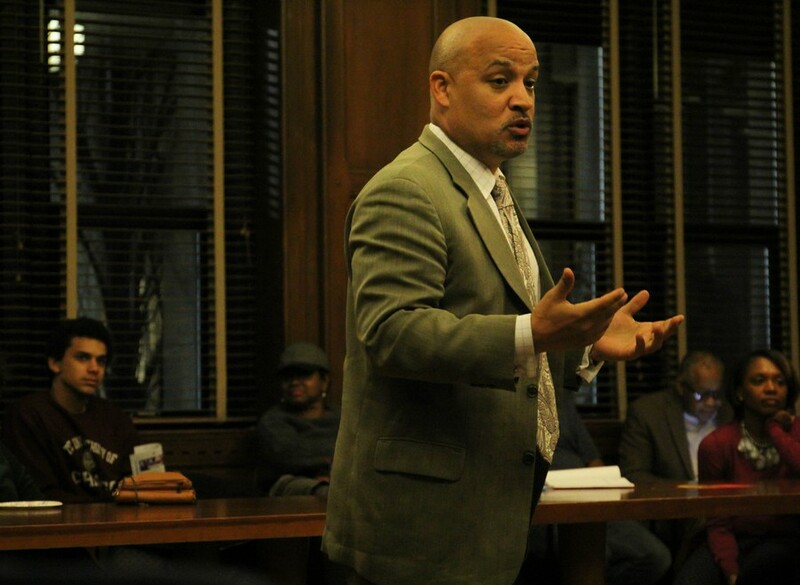 Lucas, a real estate attorney and former teacher, as well as an active community member and parent, is also dedicated to addressing violence in the Fourth Ward. She considers the epidemic of gang violence a direct result of underfunded schools and a general lack of commercial development. McCarthy, currently a municipal attorney and a former certified public accountant and business law professor, is similarly dissatisfied with the city council’s performance and believes he can do something about it. The only candidate born in the Fourth Ward, Moore is a management consultant, realtor, and attorney whose focus includes representing children in divorce cases. He has served as a member of various community organizations, including senior housing, workforce development, and the board of the South Side YMCA.